The women's rights movement in nineteenth-century America has primarily been interpreted as a secular movement. 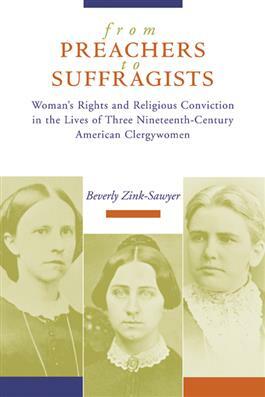 However, in From Preachers to Suffragists, Beverly Zink-Sawyer examines the lives of three nineteenth-century clergywomen--Antoinette Brown Blackwell, Olympia Brown, and Anna Howard Shaw--who, seeing their calling to the suffrage movement as an extension of their call to ministry, left the parish to join and become leaders in the movement. Zink-Sawyer tells the stories of their courageous lives, quoting their sermons and writings and tracing their struggles before and after ordination. In doing so, she persuasively demonstrates the vital importance of these leaders--of their religious rhetoric and their theological leadership--in shaping the movement as a whole, reclaiming its religious roots and making a major, even corrective, contribution to American history.